This is a basic 16 character by 2 line Alphanumeric display. White text on Blue background. Utilizes the extremely common HD44780 parallel interface chipset . Interface code is freely available. 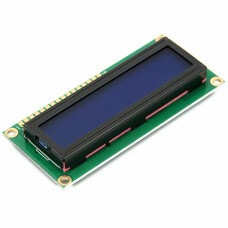 You will need Minimum 6 general I/O pins to interface to this LCD screen. Includes LED backlight. Works in 4bit and 8 bit Mode.